The body of Mexican reporter Rene Orta Salgado was found over the weekend by police in the trunk of his car in the central state of Morelos, prosecutors said. The journalist’s face was covered with a bandanna and “there were apparently no wounds from firearms,” the Morelos Attorney General’s Office said. Orta Salgado’s body was discovered Sunday afternoon in a neighborhood in Cuernavaca, the capital of Morelos, located about 90 kilometers (some 55 miles) from Mexico City, the AG’s office said. The vehicle “did not have any impacts from firearms, nor traces of blood or signs of violence in its interior or exterior,” the AG’s office said. Orta Salgado’s relatives identified his body and an autopsy will be conducted to determine the cause of death, the AG’s office said. The journalist was reported missing by his family on Saturday, prosecutors said. Relatives told authorities that Orta Salgado was last seen at an establishment in the northern section of Cuernavaca Friday night and early Saturday, the AG’s office said. Orta Salgado organized a group last December to help elect Institutional Revolutionary Party, or PRI, presidential candidate Enrique Peña Nieto, media reports said. Two other attacks on journalists and media outlets were reported in the past few days. Over the weekend, the National Human Rights Commission, or CNDH, said it was investigating the attack last week on journalist Gerardo Ponce de Leon in Hermosillo, the capital of the northern state of Sonora. Ponce, editor of the Marquesina Politica news Web site, was beaten by two unidentified men last Thursday. Attacks on journalists “are systematic in Mexico” and the issue gets little attention, with inadequate justice in cases involving attacks or abuses of power against journalists, the CNDH said. A total of 580 complaints have been received from journalists since 2005 and 69 protective orders have been issued, the commission said. The El Mañana newspaper in Nuevo Laredo, a border city in northern Mexico, was attacked on Friday night. Gunmen threw a fragmentation grenade at the newspaper’s offices and opened fire on the front of the building, damaging the structure and three vehicles parked outside. This is the second time that El Mañana is the target of a grenade attack. 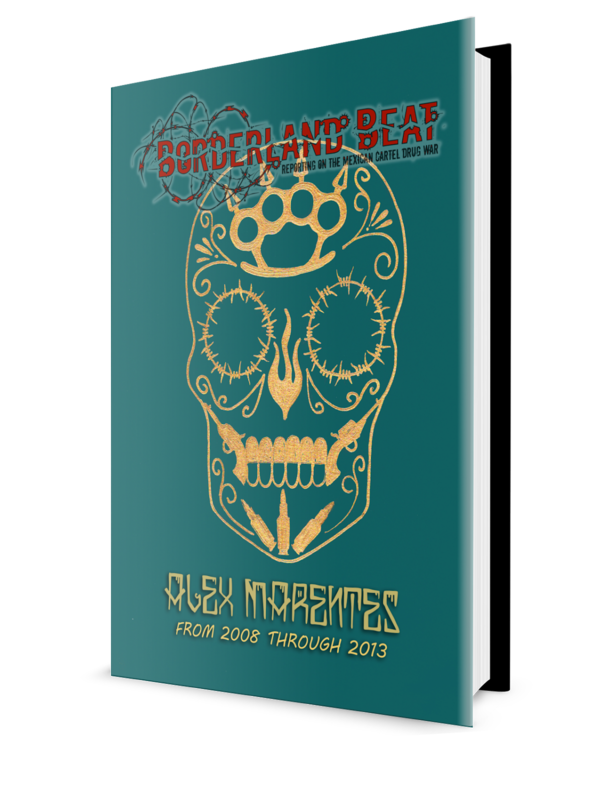 Gunmen attacked the newspaper on Feb. 26, 2007, seriously wounding reporter Jaime Orozco, who was shot in the back and left paralyzed. Seven journalists and media outlets have been attacked in Mexico in the past few days, with officials or people linked to politicians possibly involved in three of the incidents, the Foundation for Freedom of Expression, or Fundalex, said. The killing of Rene Orta Salgado, a former El Sol de Cuernavaca reporter whose body was found Sunday, is among the most serious incidents. Gerardo Ponce de Leon, editor of the Marquesina Politica Web site, was threatened and beaten with a pipe by two men at his office on May 10. Gunmen opened fire on May 7 on the offices of the Hora Cero newspaper in Reynosa, a city in the northeastern state of Tamaulipas, while the offices of Megaradio Guadalajara were attacked on May 10 and the Nuevo Laredo daily El Mañana was attacked on May 11, the Fundalex said. “It is not healthy for anyone in Mexico to have a rise in attacks of an authoritarian nature designed to silence freedom of expression and restrict Mexicans’ right to information,” the press rights group said in a statement. State legislatures should approve the reforms to Article 73 of the constitution requiring federal officials to prosecute crimes against journalists and media outlets, as well as Article 71, which opens the way for the Law to Protect Defenders of Human Rights and Journalists, the Fundalex said. Public servants or people linked to politicians may have been involved in two of the recent attacks, while a mayor is presumed to have played a role in another attack, the press rights group said. “The Fundalex considers it regrettable that subjects close to or under the orders of those who are responsible for the promotion, dissemination, protection and defense of society’s right to freedom of expression and right to information might be involved in these attacks,” the non-governmental organization said. “Due to the situation created by the attacks on journalists,” a weekly tally of attacks on the press in Mexico will now be kept, the press rights group said. Four United Nations and Inter-American Commission on Human Rights, or IACHR, rapporteurs urged the Mexican government Monday to quickly enact the Law to Protect Defenders of Human Rights and Journalists. “We need to break the cycle of impunity in Mexico, which is becoming an increasingly more violent place for journalists,” U.N. rapporteur on freedom of expression and opinion Frank La Rue said. 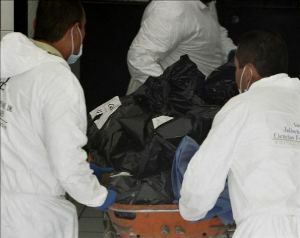 The government of Mexico’s Morelos state has asked the federal Attorney General’s Office for assistance in investigating the murder of journalist Rene Orta Salgado, whose body was found over the weekend in the trunk of his automobile, state officials said. State prosecutors are already “in touch with authorities from the Attorney General of the Republic’s Office so that, via the Special Prosecutor’s Office for Crimes against Freedom of Expression, it can participate and work on this investigation,” the Morelos Attorney General’s Office said. 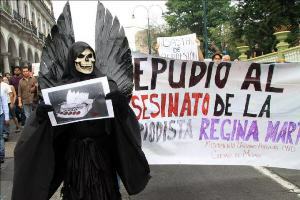 The Morelos bar association, media outlets and human rights groups have been asked to take part in the investigation “as coadjuncts of the prosecutor’s office for homicides” to ensure there is transparency, the AG’s office said. Detailed information about the progress being made in the investigation will be released on Friday, the AG’s office said. Orta Salgado was stabbed in the chest and abdomen, beaten and strangled, media reports said, citing acting Morelos AG Mario Vazquez Rojas. 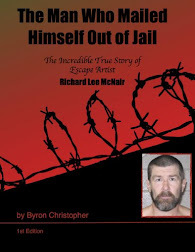 “The way in which the homicide was perpetrated is not common. This is the only case of deprivation of life that we have with these characteristics,” Vazquez told the El Universal newspaper. The journalist’s face was covered with a traditional multi-colored bandanna, officials said. Orta Salgado’s relatives, who had reported him missing on Saturday, identified the body, prosecutors said. Attacks on journalists “are systematic in Mexico” and the issue gets little attention, with inadequate justice in cases involving attacks or abuses of power against journalists, the CNDH, Mexico’s equivalent of an ombudsman’s office, said over the weekend. The Foundation for Freedom of Expression, or Fundalex, said in a statement released Monday that seven journalists and media outlets have been attacked in Mexico in the past few days, with officials or people linked to politicians possibly involved in three of the incidents. 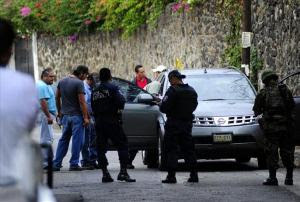 The killing of Orta Salgado, a former El Sol de Cuernavaca reporter, is among the most serious incidents, the Fundalex said. Ironic that Journalist are usually major liberals,and yet suffer from the lack of law and order. Mexico is lawless,criminal gangs run wild and are so arrigant that they attack anybody at will, their censorship of the Media is one more example of just how F/U Mexico is! Does that imply that Liberals are the best of people?They are usually some of the most corrupt,and hypocritical people you can find. "Do as i say,not as i do"Their phony morals are the ones that obscure the truth from being told in case you might offend someone. "Live and let live as long as you don't live near me"As in all political leanings,there are good and bad. A quick point on this post,look at how many comments it has garnered?Not as interesting as killings and capos names,so no-one is bothered to make a comment,no-one is interested in innocent people being killed,but it is human nature,,,sadly.